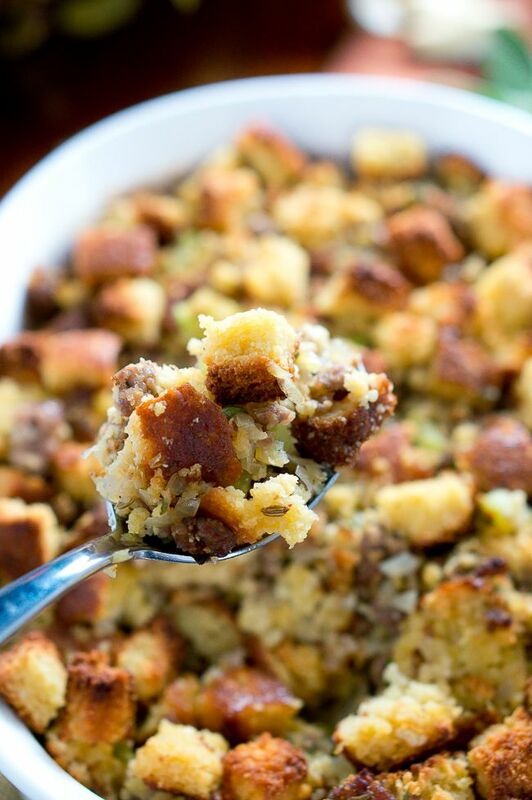 If a cornbread and sausage stuffing is a must on your Thanksgiving table, this recipe will not disappoint! 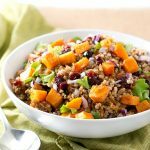 Organic and grass fed ground pork sausage is combined with cornbread, onion, celery and fresh herbs to create a great tasting stuffing you won’t believe is gluten free, grain free and easily made Paleo. It’s so delicious – everyone will be asking for seconds. If you are preparing dinner for a large crowd (10 + people), I recommend doubling the recipe. It’s also very easy to make and comes together quickly. 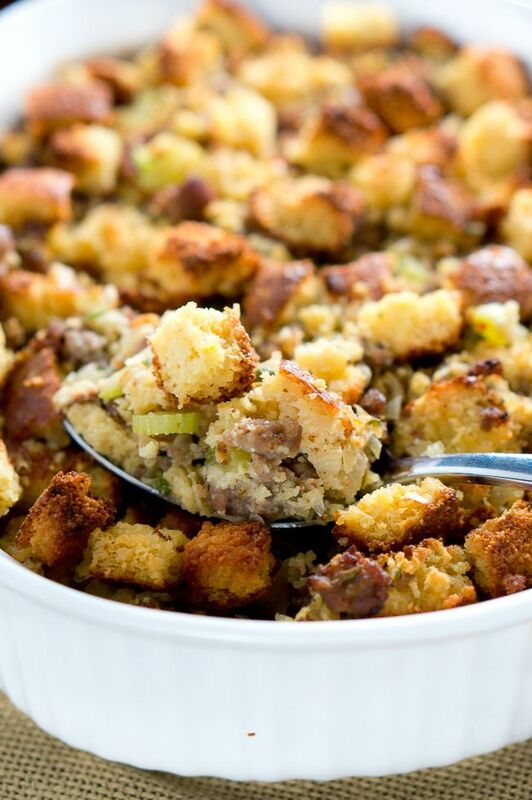 You can make the stuffing 1 – 2 days earlier and keep it in the fridge until Thanksgiving. It will save you some time on Thanksgiving day so you have enough time to make the turkey. It’s best to cut the cornbread and let it sit out overnight to get hard & dry, but if you are pressed for time you can put it in the oven at 250°F for about 30 minutes, stirring half way until the bread is completely firm. This post is my final post from my Thanksgiving side dishes I shared with you this month. 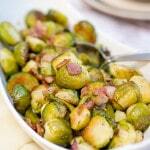 I will compile a recipe roundup with some amazing and delicious side dishes for Thanksgiving from fellow bloggers. I will email them to you over the weekend. Don’t forget to check here or your email. Preheat oven to 350 F. Cook ground sausage over medium heat in a skillet and break up in pieces using a wooden spoon. When cooked, transfer to a large mixing bowl. Heat olive oil in the skillet and add onion and celery and cook, stirring frequently until the vegetables are tender about 5 minutes. Add chopped parsley and sage leaves, and stir well until the flavors are incorporated. Season with salt and freshly ground black pepper. Transfer the mixture to the bowl with the sausage. Add dried cornbread to the mixing bowl. Whisk eggs and chicken/vegetable stock and pour over the cornbread and sausage mixture. Toss gently until all ingredients are wet. 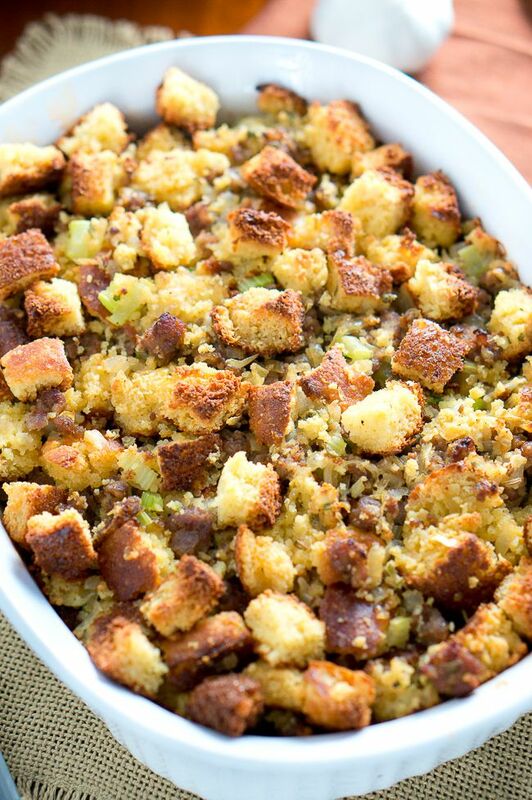 Cornbread and Sausage Stuffing (gluten free, grain free) is hands down the best stuffing I have had. 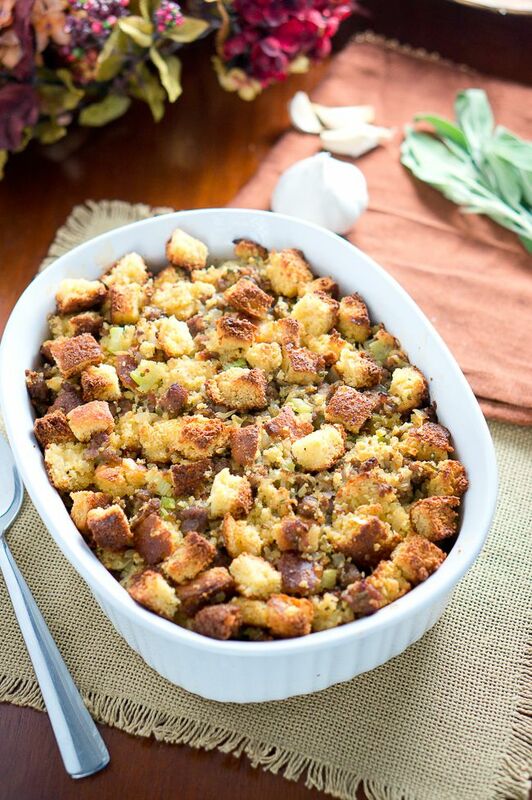 Great tasting stuffing you that is light and healthy. The nutritional info label doesn't include the nutritional info for the cornbread. Check out the cornbread recipe and nutritional info. 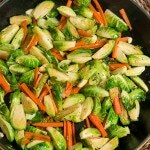 Loving this side dish! This is my second Thanksgiving and the first in the US! My family lives across the oceans:) So glad you you have spending Thanksgiving with your family! I LOVE cornbread. Never thought of using it as a stuffing. I bet it absorbs all the flavours really well. I love stiffing mixes and the combination of sausage and cornbread sounds awesome! Love! It looks amazing. I may have to try this recipe for xmas. I don’t eat pork, so if I were to make this could I use minced lamb or beef instead? 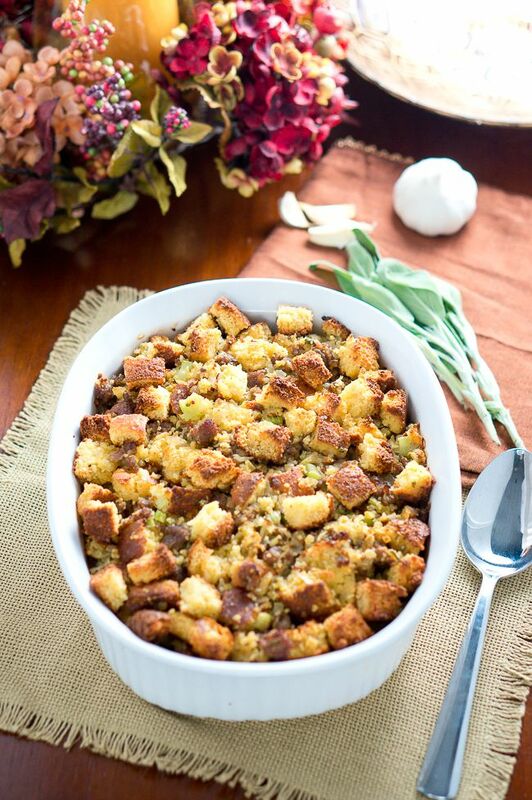 I think the stuffing is one of my favorite sides at Thanksgiving! Your recipe sounds delicious! Thank you for sharing. I love a good stuffing, it’s one of my favourite bits of a roast dinner. It sounds like you’re going to have a great time with all the family around. I’m sure you’ll all enjoy it. look at that color, what a beautiful, curated dish. happy thanksgiving! Oh my goodness this sounds so good! You certainly kicked stuffing up a notch! Pinning for later! 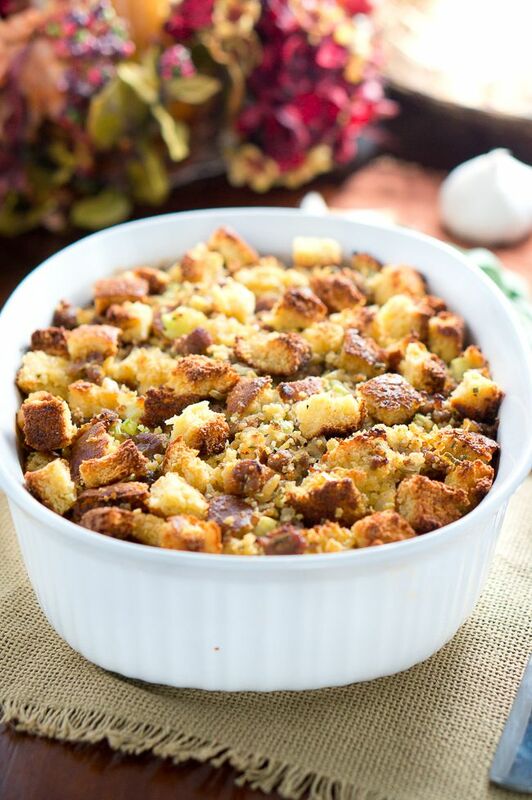 Beautiful stuffing recipe Neli! 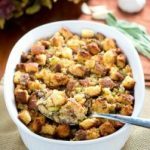 I love sausage stuffing and this version looks delicious! That stuffing looks amazing, crisp and full of flavor. Yum, Your recipe looks awesome! This sounds like a delicious stuffing! Great colours! My gluten-free friend was just lamenting how much she misses stuffing. I’ll have to send her this! If making cornbread and sausage stuffing do you bake it then save it in fridge? If so how do you reheat? Can I stuff this inside a turkey? It is meant to be served as a side dish along with the turkey. I havent stuffed a turkey with it before.